This Wire-to-Air Digital Wireless Microphone and Audio Link - AWS8152 can change your audio entertainment environments into wirelessly. Move without the limitations of a cord and still get the high fidelity, stereo sound you expect up to 100 ft. .This product can provide wireless capability for any audio source which has “line out” or USB output, such as TV set, PC, DVD player, Mp3 player, Mobile Phone, TV Set-Top box, Hi-Fi Stereo system, etc. Perfect for in-home use with stereo systems as well as mobile devices and all devices using a 3.5mm earphone jack or PC/NB/Tablet using an USB port. Simply plug the transmitter into any audio device and sync it to the receiver, connecting with any earphones or headphones of your owned and enjoy high-quality sound wirelessly with crystal- clear digital sound quality. 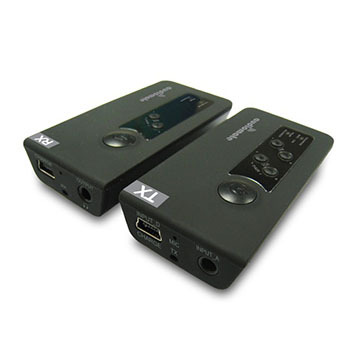 2.4GHz digital FHSS technology improved interference resistance and smooth audio streaming. Super high S/N and 20 ~ 20 KHz full range Hi-Fi stereo sound quality. Extremely simple Plug-and-Play design without any installations. Compatible with any type of earphones / headphone,active speakers and Hi-Fi gears. 360° omnidirectional transmission and reception for free roaming of up to 30m radius. Multiple receivers with single transmitter for wireless broadcasting applications. Compact and slim stylish design for comfortable long-time use and easy carrying. Auto channel tracking between receivers and transmitter. Automatic switch between MIC and music input modes by auto input detection. Built-in microphone for voice broadcasting. Built-in Li-ion rechargeable battery & charger for both transmitter and receiver. Wireless Public Address(PA) System for Teching Aid(s) & Public Broadcastings.